Sydney in December is gloriously warm, sunny and the perfect place to catch up with family and friends over the holidays. If you’re planning to celebrate Christmas in Sydney, here’s what to do for a festive season to remember! Martin Place is one of the most beautiful places to be over the Christmas period with its vibrant interactive tree and festive decorations. You’ll be in the perfect spot to hear some of the city’s best choirs singing nightly here between 6 and 8pm right through to Christmas Eve. Pitt Street Mall is another excellent place to spend some time – not only can you pick up last-minute gifts but you can also sing along to carols underneath the stunning light forest of almost 80,000 glittering LEDs. Choirs will be singing here every Thursday, Saturday and Sunday between 6 and 8pm up until 21 December. 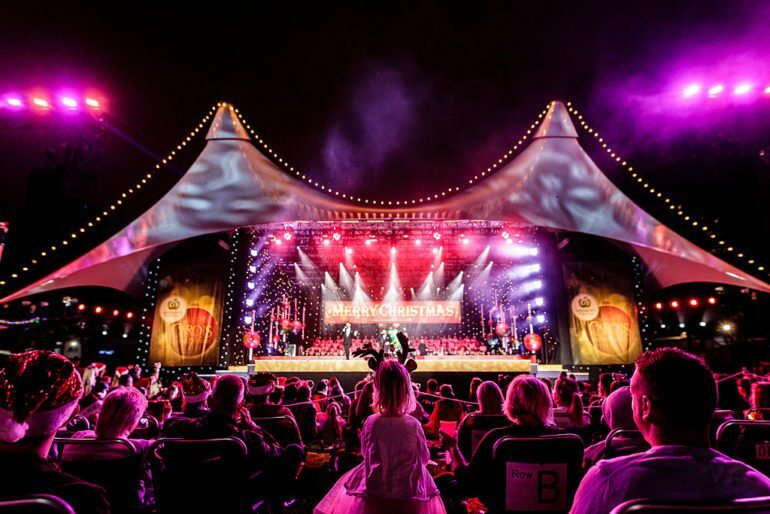 Carols in the Domain is a Sydney icon of Christmas celebration, and this family-friendly event at The Domain is held just a short distance from our Pitt Street, Kent Street and World Tower accommodation. Come along from 12 pm on 17 December and take part in the Christmas Carnival with food, drinks, kids’ entertainment and rides. Pre-show entertainment begins onstage from 3 pm, with the main event kicking off at 7:45 pm. This year you’ll be treated to performances from the cast of the Wizard of Oz stage show, Adam Harvey and Becky Cole, Jersey Boys, Todd McKenney, Dami Im and CDB – plus a special appearance from Santa! Where’s the best Christmas lunch in Sydney? We say anywhere with a clear view of Sydney Harbour or the Bridge. If you’re in a large group or family you might like to hop onto one of the many harbour cruises offering a buffet lunch to wine and dine your way along the waterways. If you like keeping your feet on the ground then find a multi-course Christmas lunch with a view of the water, for example at 360 Bar and Dining, The Bather’s Pavilion or O Bar and Dining. Prefer something low fuss? Find a fish and chip shop and savour the view from the water’s edge, wherever you happen to be!